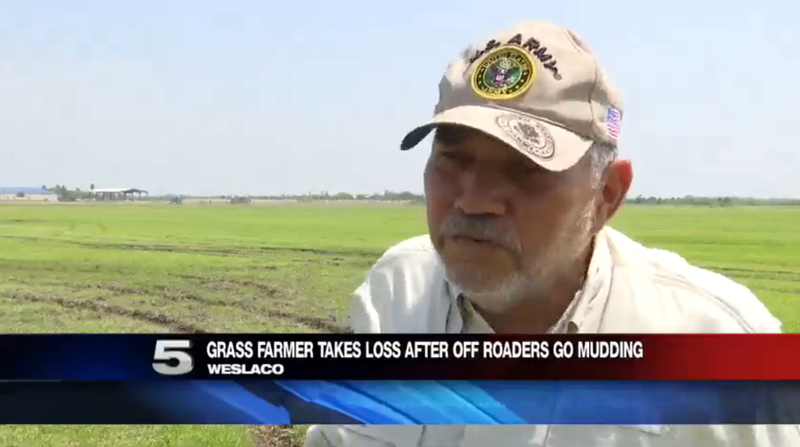 A Texas grass farmer (yes, actual grass, not weed, which we call “pot”) just had about 25 grand worth of crop destroyed by hooligan off-roaders, KRGV Channel 5 News reports. Of all the places to go hooning, they find the one guy who actually makes a living from the grass. Yikes. Just look at the sadness Felix Guajardo’s face as he describes the late-night antics of a bunch of rednecks mudders who tore up five acres of his grass field. It’ll bring a tear to your eye. The grass, guys. The grass. The Texas news site reports that the grass farmer, who has nearly 50 years of experience under his belt, said each acre can usually produce 60 pallet of sod (a pallet is about 500 square feet) worth $85 apiece. Run those numbers, and you’ll find that those hooligans probably screwed Guajardo out of $25,500. I’ll admit that I myself have a bit of a weak spot for a nice, soupy mud pit. But come on folks, the whole world is covered in mud, and you had to go bogging in a grass farmer’s field? If you really need to let out your inner hoon, there’s always plenty of room in my landlord’s backyard.